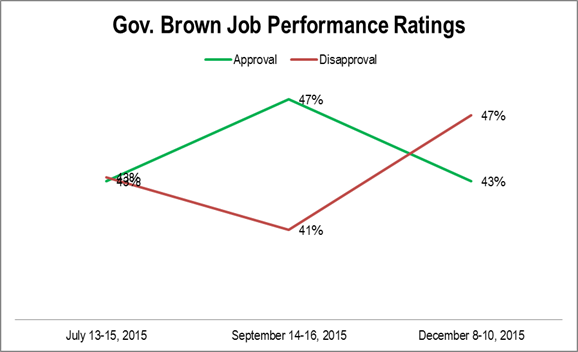 Governor Brown’s job performance, both approval and disapproval, has been tracking in the mid 40s since she assumed the position. QUESTION: How would you rate the job Governor Kate Brown is doing: excellent, good, fair, poor? METHODOLOGY: Live telephone interviews of 400 likely Oregon general election voters were conducted July 13-15, September 14-16, and December 8-10, 2015. 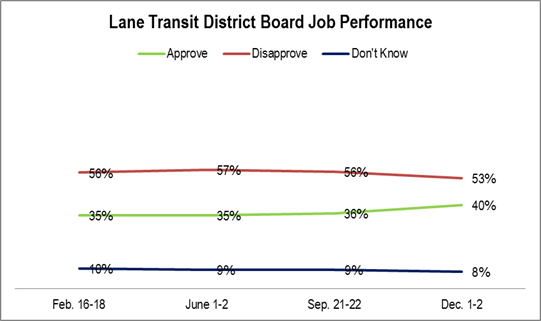 The margin of error at the sample median is 5%. Quotas were established based on gender, age, party, and region. Totals may not equal 100% due to rounding. 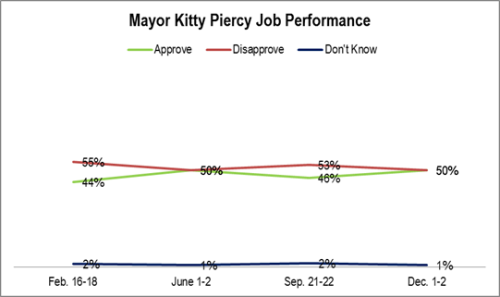 Kate Brown’s recognition, as well as favorable and unfavorable ratings quickly rose after she became governor, but has since remained largely unchanged. QUESTION: I am going to read the names of some people. Please tell me whether you have heard of each. 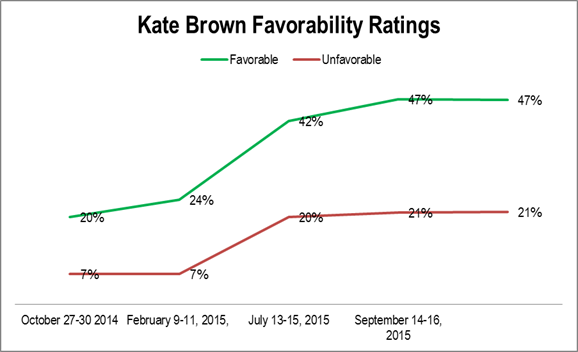 IF HEARD OF … Do you have a favorable or unfavorable opinion of Kate Brown? IF FAVORABLE OR UNFAVORABLE: Is that strongly or somewhat? METHODOLOGY: Live telephone interviews of 400 likely Oregon general election voters were conducted October 27-30, 2014 and February 9-11, July 13-15, September 14-16, and December 8-10, 2015. 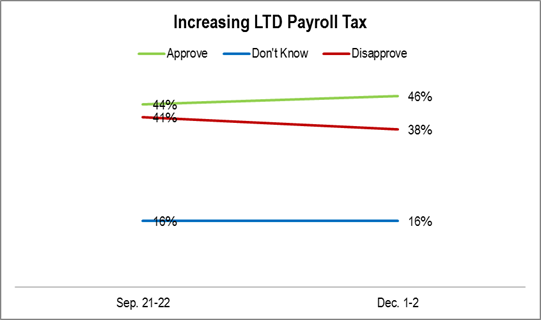 The margin of error at the sample median is 5%. Quotas were established based on gender, age, party, and region. Totals may not equal 100% due to rounding. John Kitzhaber’s favorable and unfavorable ratings dropped in 2015 after his ethical problems became clear. His ratings have stabilized since his resignation. QUESTION: I am going to read the names of some people. Please tell me whether you have heard of each. 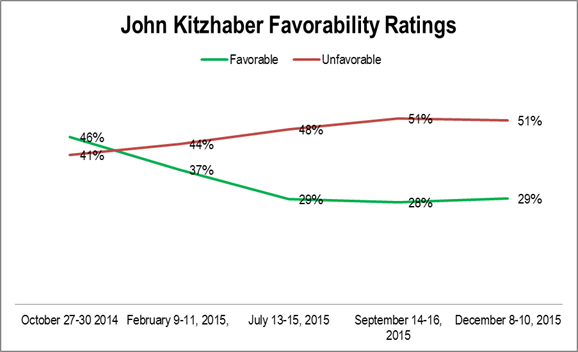 IF HEARD OF … Do you have a favorable or unfavorable opinion of John Kitzhaber? IF FAVORABLE OR UNFAVORABLE: Is that strongly or somewhat? 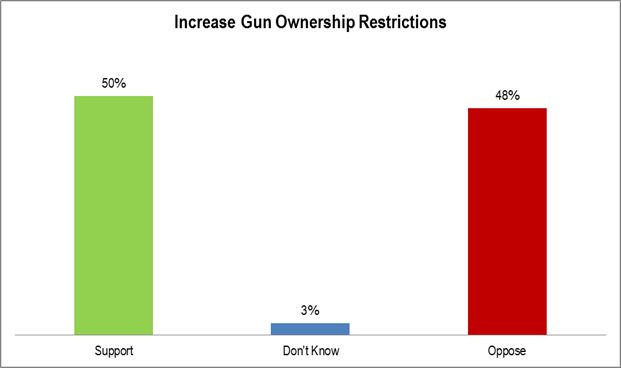 Whereas the new gun background checks law is strongly supporting, adding increased gun restrictions to that new law is a toss up. 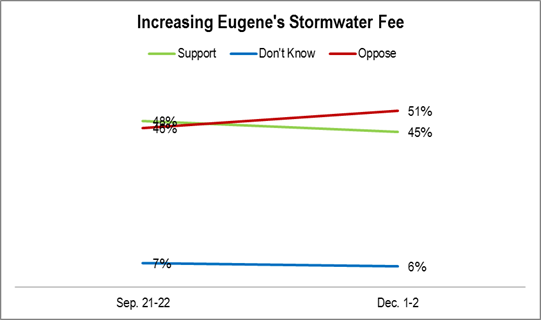 The incredibly low “Don’t Know” percentage testifies to the entrenched viewpoints. It is important to note that no specific restriction was mentioned in the wording of the question. QUESTION: Do you support or oppose increasing restrictions on gun ownership? METHODOLOGY: Live telephone interviews of 400 likely Oregon general election voters were conducted September 14-16 and December 8-10, 2015. The margin of error at the sample median is 5%. Quotas were established based on gender, age, party, and region. Totals may not equal 100% due to rounding. The job performance rating for the LTD board remained essentially constant and, on net, negative, in 2015. There was an uptick at the end of the year. The question is whether this will be sustained in 2016. 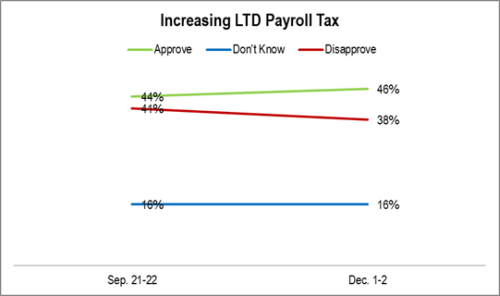 Support for the LTD payroll tax increase has gone up and opposition has gone down so, now, the difference is statistically significant. Interestingly, the undecided are still at nearly 20% and the total support is still under 50%. This implies that, though the net support is positive, it has not yet firmed up. QUESTION: Do you support or oppose Lane Transit District increasing its payroll tax from $7 per $1,000 payroll to $8 per $1,000 payroll over the next ten years? 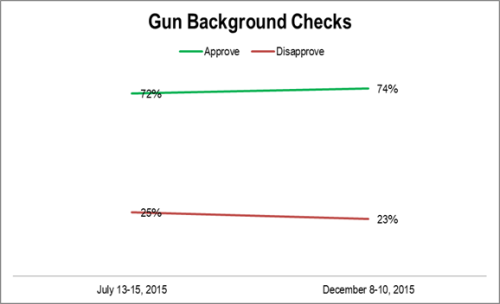 Statewide gun background checks continues to receive overwhelming support. 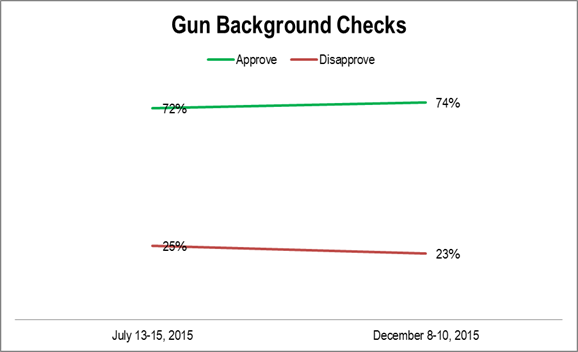 QUESTION: Do you approve or disapprove of requiring criminal background checks for private gun transfers? METHODOLOGY: Live telephone interviews of 400 likely Oregon general election voters were conducted July 13-15 and December 8-10, 2015. The margin of error at the sample median is 5%. Quotas were established based on gender, age, party, and region. Totals may not equal 100% due to rounding. 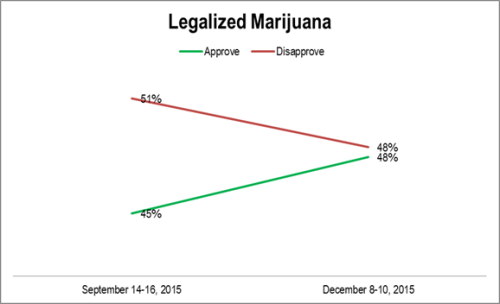 QUESTION: Do you approve or disapprove of legalized marijuana in Oregon? 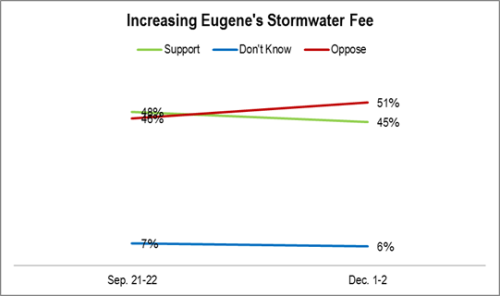 Opposition to the stormwater fee has increased slightly over time. Mayor Piercy continues with the same general job performance numbers as in the past: she is hovering near 50/50 and slightly net negative.